Photography is a buzzing thing that occupies a significant part of our life. We cannot but get in touch with photography for both personal and professional purposes. But whenever we search for a photo editing company, we end up with the excretion of sweat. It is because there are many low-quality photo editing companies across the world. Though there are many professional photo editing companies, it is not an easy task to find out professional photo editing service. But you have nothing to worry as long as we are with you. To help you get rid of troubles, we have written this article. History: Image Retouching Lab started its journey in the industry of photo editing in 2012. That is to say, the company has a long experience of working in the industry. Currently, it is operating 4 offices in different countries namely Bangladesh, Netherlands, Norway, and Malaysia. But it provides services all over the world. Services: The company provides a number of professional services to its clients. Generally, It provides 12 kinds of photo editing services. And the services are Image Retouching, Clipping Path, Image Masking, Image Mannequin, Shadow Creation, Mirror Effect, Color Correction, Web Optimization, Image Restoration, Raster to Vector, Graphics Design, Twitch Overlay, etc. Portfolio: Portfolio is the first thing you need to emphasize on while finding a good photo editing service. In terms of portfolio, Image Retouching Lab shows us its splendid professionalism. It has a good number of photo examples on its website. One can easily look into the examples before making an order. Pricing: When it comes to pricing, we can consider Image Retouching Lab as one of the most reasonable photo editing companies around the world. You can take one of the services of the company at a price which is as low as $0.29. However, depending on the tasks on your image, the company charges up to $20.99. History: Invensis Digital Photo Editing Services is a veteran company in the arena of image editing. The company is a sister concern of Invensis Technologies, which is a BPO service provider. It has been working for 10 years in the industry. And it claims to have well-versed photo experts using the latest technologies in the field of photo editing. Services: The agency provides its clients with a bunch of photo editing services. And the services include Wedding Photo Retouching, Portrait Retouching, Photo Restoration Service, Image Clipping path Service, Stock Photo Retouching, Real Estate Photo Editing, Product Photo Retouching, Photo Masking, etc. Portfolio: As a renowned company, Invensis Digital Photo Editing Services has professional portfolios under each of its service pages. So, you won’t have to undergo troubles to look into the portfolios of the company. All you have to do is to click on a particular service page to see the portfolio of the service. Pricing: In terms of pricing, the company is notably cost-effective. In general, the company does not have any pricing plan for its clients. It is because the company customizes the fees of photo editing according to the requirements of the clients. But there is nothing to worry about since the services of the company will not cost a huge amount of money. History: Fotofigo is an online digital photo editing company providing different services to its clients. Though it is an online company, it is not new in the field of photo editing. The company has a long track of experience in the photo editing industry. And it claims to have processed over 5 million photos for individual clients. Services: FotoFigo offers a number of photo editing services to its clients all over the world. The services are Photo Enhancement, Ecommerce Photo Editing, Event Photo Editing, Portrait Retouching, Photo Manipulation, and Real Estate Image Editing. To about these services in detail, have a look at the website of FotoFigo. Portfolio: The company has a nice portfolio to show its previous work samples to potential clients. To check the samples, you have to click on the “Gallery” tab. And you will find the tab at the top of the homepage of the website. However, if you want to make an order at the company, don’t forget to check the examples first. Pricing: FotoFigo has four pricing plans namely Figo Ten, Figo Plus, Figo Saver, and Figo Max. You have to spend $20.29 for Figo Ten, $50.29 for Figo Plus, $100.29 for Figo Saver, and $200.29 for Figo Max. Though the pricing plans seem to be too high at first sight, they are actually not high. To clarify, the pricing ranges of the plans cover 10 to 100 images. History: With a bunch of highly skilled graphic designers, Clipping Beast stands as one of the best photo editing companies. Though the company started its journey in 2017, it has over 100 Photoshop professionals who are working hard to turn raw product images into professional ones. In fact, it is one of the most growing photo editing companies in the world. Services: Offering a good number of photo editing services, Clipping Beast has been able to draw the attention of many professionals across the world. The main services of the company are Image Editing Service, Clipping Path Service, Masking Service, Model Retouching Service, Color Correction, Image Shadow Service, Image Reflection Service, Recolor Service, Cropping and Resizing Service, Ghost Mannequin and so on. Portfolio: Like many other photo editing companies, Clipping Beast has a professional portfolio for its potential clients. If you are one of their potential clients, then you can go for checking out the portfolio at their website. You will find it on the “Gallery” tab, which is at the top of the homepage. We ensure you that you will like the examples of their previously edited photos. Pricing: The services of the company are cost-effective for anyone in the world. They do not cost you too much. For instance, the service charge of the company starts at $0.50 per image. Doesn’t it sound reasonable? It is reasonable indeed. So, if you want to get professional photo editing service at a reasonable price, then you should give Clipping Beast a knock. History: Photza is perhaps one of the most dominating photo processing companies around the world. The company started its journey in 2012 holding the hands of Emma and Noah, two successful entrepreneurs. It has a professional team of photo editors having many years of experience. Consequently, the company can solve almost any issues related to photos. In addition, it never compromises with the deadlines. Services: Unlike many other photo editing companies, Photza does not offer a huge number of services to its clients. The company mainly focuses on Retouching, Photo Restoration, Portrait Retouching, Wedding Photo Editing, etc. Since Photza offers a few services in the field of photo editing, it can meet the quality of work in the smartest way. Portfolio: Photza does not have any individual portfolio tab on its website. But you can find the example of works of Photza on the website without facing any hassles. To check them out, you need to browse on the service pages. Once you click on a service page, you will get in touch with some beautifully edited photos. Pricing: If you are searching for a cost-effective image editing company, then you might be glad to take one of the services of Photza. The company provides high-quality services in the field of photo editing. You have to spend $3 to get a photo edited by the professional retouch artists of Photza. Depending on your needs, their services may cost you up to $15. History: PixoPal is a leading photo retouching platform specializing in retouching product images, fashion images, jewelry images, furniture images, and real estate images. There is a collection of CSE engineers, photographers, and technophiles working behind the stage of the company. They are determined to face the challenge fo the image editing market. Services: Having a bunch of photo experts, PixoPal offers a good number of services under two categories. The agency usually offers its services for photographers and for ecommerce. If you are a photographer, then you will be glad to know that PixoPal offers Product Retouching, Real Estate Retouching, and Headshot Retouching. And for ecommerce business owners, the company is ready to offer Ecommerce Photo Editing, Image Alignment Service, Shopify Photo Editing App, etc. Portfolio: PixoPal has an outstanding portfolio on its website. The portfolio seems to be highly professional as there are a number of eye-catching photo examples placed under the Portfolio Tab. You will find examples of their previously edited photos under 7 categories. Choose the category of your photos and check the examples to place an order. Pricing: The agency has simple and transparent pricing plans for its potential customers. The price of the service of PixoPal starts from just $1.00. And their turnaround time is highly satisfactory. However, PixoPal has different pricing plans under the categories of E-commerce, Premium Product, Headshot, and Real Estate. History: Offshore Clipping Path is a photo editing agency, which is owned by two siblings. The siblings started this business in 2010 in order to help professional photographers with post-production work. In addition, the agency also works with art directors, ecommerce business, photo agencies, and studios. Services: The company comes up with numerous services in the photo industry. The services are Ecommerce Image Editing, Clipping Path Service, Image Masking Service, Neck Joint Service, Multiple Clipping Path, Drop Shadow Service, Image Manipulation, Photo Editing Service, Photo Restoration, Photo Retouching Service, Color Correction, and Raster to Vector Service. Portfolio: The “Gallery” tab of the website contains a professionally designed portfolio. The images included to the portfolio are substantial enough to prove the quality of the work of Offshore Clipping Path. In fact, the experts of the company edit photos very poignantly. You will never have the chance to go back to them with a complaint. Pricing: The price range of the company is highly affordable for both photographers and ecommerce business owners. Basically, the price of the services provided by Offshore Clipping Path starts at just $0.29 per image. And if your photos require extensive editing, then you need to spend $7 per image. History: It is a famous photo retouching agency working hard to meet the demands of magazine publishers, ecommerce business owners, and photographers. The agency has years of in this field. Its turnaround time is also very fast. Moreover, the experts of Retinka will never hesitate to revise your photos over and over again. Services: The services of the company are included in three categories. The categories are Basic Fix, Extensive Editing, and Advanced Service. If you take a service from the category of Basic Fix, you have to spend 1 credit per image. Extensive Editing will 3 credits per image, while Advanced Service will cost 5 credits per photo. To learn more, have a look at their website. Portfolio: Retinka has an exceptional portfolio on its website. You will see a bunch of photos popping up before you whenever you peep into the portfolio of the agency. Since all the photos of the portfolio are gorgeously edited, you will be bound to make a quick decision to place an order at the agency. Pricing: Retinka stands with 4 affordable pricing plans for its clients. The pricing plans are Cheap Tryout, Best Choice, Most Popular, and Business. You will get Cheap Tryout at $12, Best Choice at $115, Most Popular at $559, and Business at $1079. History: Digi5 Studios is a leading image editing company working in the field for more than 9 years. It has a big team of skilled photo editors who are determined to produce high-quality work related to photoshop. And they strive to take your images to the next level. Services: The agency offers 5 kinds of services in the arena of photo editing. Product Photo Retouching, Automobile Photo Retouching, Clipping Path Services, Fashion Photo Retouching, and Real Estate Photo Retouching are the services which Digi5 Studios offers. Portfolio: To find out the example photos of the agency, you need to browse on the service pages. Digi5 Studios has decorated its service pages with a bunch of nicely edited photos. For this reason, we can consider the service pages as the portfolio of the company. Pricing: When it comes to pricing, Digi5 Studios is highly affordable for any kind of professionals in the world. It charges as low as $0.50 per image for Product Photo Retouching. For a Clipping Path Service, the company charges around $0.20. So, you can easily imagine that the services offered by the company are cost-effective. History: Photo Trims is one of the most famous online outsourcing firms in the world. It started its journey in 2012 with a view to helping different professionals. Having more than 100 staffs, the firm is working with great popularity. The experts of the firm can handle over 3 thousand images per day. Services: The firm comes up with a great number of services from background removal to corporate identity. To clarify, Photo Trims offers almost all the services related to photoshop. Although the company offers a variety of services, it is determined to meet the standard of its work at any cost. Portfolio: Photo Trims has a portfolio on its website to show its previously edited photos to potential clients. You will find the portfolio at the right top of the website. If you are planning to take a service from the company, then try to check the example photos first. This will make you optimistic about the service of Photo Trims. Pricing: If you are looking for a cost-effective service to edit your raw photos, you can take Photo Trims into consideration. It is because the firm provides low-priced services to its clients. To clarify, you have to spend from $0.30 to $2.50 per image to get any service from Photo Trims. To sum up, professional photo editing service are rare in the market. But there is always a way to the problems prevailing around us. Unfortunately, it is the hardest task to find out the way that will work for you. 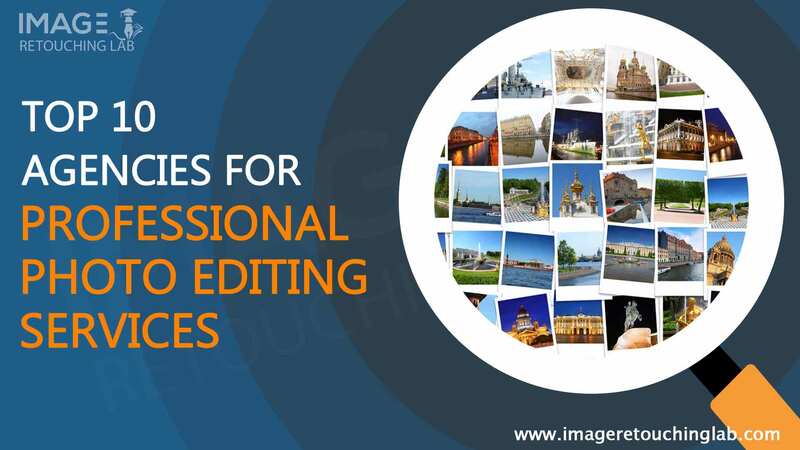 Considering this matter, we have compiled these 10 photo editing agencies. You are recommended to choose one of the agencies to help you edit your photos.